The Summer Garden is the oldest park in St. Pe­tersburg. It occupies an area of 11.7 hectares. The work of laying out the Summer Garden began in 1704. It was created in “regular” style with straight al­leys. Peter I ordered saplings of trees and flowers from everywhere for his “paradise”. He himself planted oak alleys. Peter I planted the garden with rare trees and flowers. Peter the Great dreamed of creating a garden more beautiful than that at Versailles. There were several fountains depicting subjects from Aesop’s fables. The river feeding these foun­tains got its name — Fontanka. The fountains were damaged by floods in 1777. They were never restored. The railing of the Summer Garden was designed by the architect Yuri Felten. It was erected in 1770- 1784. This railing is one of the finest examples of artistic wrought-iron work in the world. There are many marble sculptures in the Summer Garden. "Before the northern facade of the Summer Garden stands the group Peace and Abundance. This group was created by the sculptor Pietro Baratta in 1722.It is an allegorical depiction of Russia’s victo­ry in the Northern War. All in all there are twenty rooms in the palace: ten on each floor/The interior planning of each floor is the same: six living rooms, a kitchen, a corridor, and a room for the servants. The first floor was occupied by Cather­ine I and the ground floor by Peter I. On the ground floor there also was the Empres’s own kitchen where she herself cooked favourite pies of her husband. During the construction of the palace Peter I per­sonally participated in all the details: how should the plastering go, what tile should be used for the kitchen walls. Peter I didn’t like luxurious halls with high ceilings, so the Summer Palace reflected completely his tastes and character. 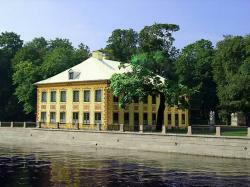 Now the museum “The Summer Garden of Peter I” is located in this building.